The Aprilaire 1730A Dehumidifier is the "baby" in the range of whole home models offered by this well known and respected manufacturer. This powerful unit will remove 65 pints of unwanted moisture every day and is well sized for smaller homes, such as town houses and condos, with a floor area of up to 1400 square feet. Like all whole home units the 1730A is installed as part of your existing HVAC system. The unit pulls the moist air from individual rooms via your existing ducting, removes the unwanted water and sends dry air back to each room. In this way a comfortable and safe level of humidity can be maintained throughout your home. The Aprilaire 1730A Dehumidifier may be used as a stand-alone unit and some are sold to householders for use in a basement or crawlspace. This model will be entirely satisfactory for this purpose but offers no special advantage over other models designed specifically for these applications. I have no reason to advise against this but the 1730A is not a model I specifically recommend for this purpose. As a whole house solution however the Aprilaire 1730A Dehumidifier is a moderately attractive proposition in certain circumstances which I explain more fully in my recommendations at the bottom of this page. The Aprilaire 1730A Dehumidifier is designed for whole home humidity control in a smaller home. For this application this model is entirely suitable and should give reliable and effective service. The small dimensions of the 1730A suit it well for its designed purpose and flexible installation options ensure that the appliance can be installed with the minimum of inconvenience within a home where space may be limited. The unit is marketed by some distributors as a stand alone model which could be employed in a basement or crawl space. It has no special merits for such applications and purpose designed units will almost certainly prove more satisfactory. 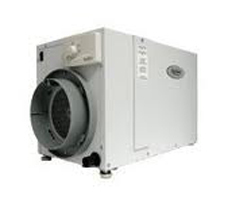 Consumer reviews of the Aprilaire 1730A Dehumidifier are very few at present. If the 1730A is as well received by users as other Aprilaire models there will be no cause for concern. For now there is insufficient evidence to draw any conclusions. I am unwilling to make any recommendation at this time. There is little or no evidence to suggest that consumers are or will be satisfied with this model and, of course, that is the acid test. Bearing in mind the long and successful track record of Aprilaire my hope and expectation is that this model will have its supporters in due course. Judging from the technical data alone my conclusion is that the 1730A is "fit for purpose" but, with the exception of ease of installation in small homes, unexceptional. I am particularly disappointed by two issues. The noise level of this unit is 55dB. This seems surprising as more powerful Aprilaire models are a little quieter! The Energy Factor of the 1730A is 1.8 l/kwh which is only equivalent to a 70 pint portable model. On balance I believe that better models are available. The only valid reason I could have for recommending the Aprilaire 1730A Dehumidifier would be for those of you for whom the flexible installation options might make this the only suitable whole home model that could be readily installed in your home.